﻿Mike has been writing for theatre for over a decade. In that time he has written for venues and companies across London. Examples include a musical for The Pensive Federation's Significant Other Festival, Poe: Macabre Resurrections for Second Skin Theatre, Insignificant Theatre's Speakeasies and Crow Theatre’s OFFIE Nominated "Jack The Ripper's London" His third full length play, Buster Keaton at The Hollywood Canteen... as told by Orson Welles, ran at The Space Arts Centre earlier this year. 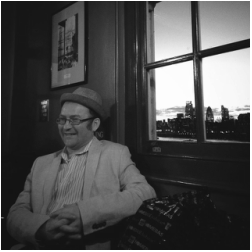 On the final Thursday of each month, Mike hosts the South London Writers' Group to support new talent. Header images: The Pensive Federation & Riff Raff Productions.